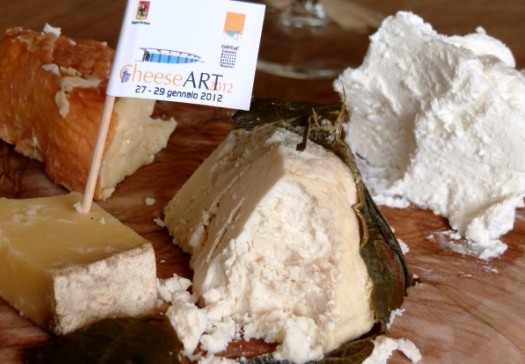 The opening of the Cacioteca Regionale di Sicilia – the Sicilian Regional Cheese Consortium – is being celebrated during Cheese Art 2012, which includes two days of Tasting Workshops with traditional cheeses from around the world. The Consortium works towards elevating the production of historic traditional cheeses to the status of “works of art.” The idea is that great cheeses should be considered among Italy’s important cultural assets, holding a place beside the many works of art for which the country is famous. During Cheese Art 2012, cheese tastings will be available with various cheese boards paired with locally sourced cured meats (priced at 14-20 euro) or you can join in the Tasting Workshops on January 28 & 29, when traditional cheeses from around the world will be paired with Sicilian wines from Cerasuolo di Vittoria and Planeta, or beers from the Baladin microbrewery of Piedmont. Cheesemaking demonstrations will take place during the course of the event – we know this is great fun, as we include it on our Eastern Sicily walking tour. Here are the cheese tasting menus in Italian, or check out the listing at the end for the 2012 Cheese Art Tasting Workshops and where they are. Located at km 5 on the SP 25, the main road from Ragusa to Marina di Ragusa. This sounds wonderful. Would love to go to Accursio’s brunch. Are you going? It was a lot of fun (if a bit disorganized) and what an incredible variety of cheeses! Didn’t do the brunch, but did a large cheese board which had a sampling of 7 cheeses of our choice, plus some artisan cold cuts (salami d’asina!) plus 2 glasses of wine – now it’s time for a cholesterol check and a nap! That type of traditional Cheese or whatever you call it may be a well loved delicacy in European areas but here in Asia we can’t stand it even from the odour alone. No offense, just sharing – I’ve seen how it’s made and I have high respect for its nutritional value. It’s kind of like the Durian here, it very healthy but only Southeast Asians enjoy it and is revolting to you people. Taste in food is relative anyway; this makes us a very diverse world worthy of exploration! You are right Tony, the specialty foods near and dear to us may not be palatable in another culture, but that’s why I love the diverse world of food! Hello, we are 3 chefs currenly in Sicily, town to Vita. Where are the classes held and do you have anything open this month?